Though the recent protests in the US would have you think that the biggest crisis facing the United States is Donald Trump’s surprise win, Native Americans have gathered in historic numbers to defend native territory from the Dakota Access Pipeline. The pipeline, if completed, will span 1,170 miles at a cost of approximately $3.7 billion. The company behind the pipeline, Energy Transfer Partners, has pushed on with the project, despite covering up its dangers and circumventing the law. Now, as the pipeline enters its final phase of construction in North Dakota, where most of the resistance to the pipeline is located, Energy Transfer Partners and its hired contractors have escalated tensions with protestors to protect the project as it enters its final phase. The State of North Dakota has also taken to protecting the pipeline. Now, it appears that the native wildlife are also targets. 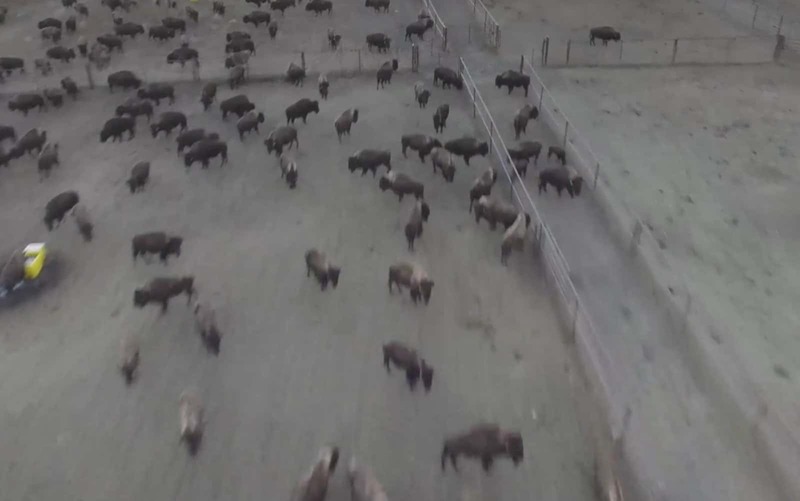 Yesterday, Indigenous Rising Media released a video showing a large group of wild buffaloes being herded into an enclosure surrounded by 8 foot deep trenches and razor wire. Current reports from the area claim that the buffaloes are being held without food or water for days. It has also been reported that the construction company building the pipeline has threatened to kill the buffaloes as they could “interfere” with the pipeline’s completion. The Animal Legal Defense Fund is currently investigating the situation and the legality of the treatment of these buffaloes. Herds of wild buffalo near the construction site captivated protestors when they appeared in a seeming show of support for the protestors during a confrontation between protestors and police. Buffaloes are sacred to the Sioux, serving as a symbol of the divine as buffaloes once provided abundant food and materials for the tribe. Due to this well-known spiritual significance of buffaloes, it is possible that their entrapment in these barbaric enclosures is intended to be used a psychological warfare against the Sioux and those that stand by them. With the pipeline nearing completion and Energy Transfer Partners getting more and more desperate, it appears they will do anything no matter how immoral or abhorrent it may be. However, it is astounding that thousands upon thousands of people who claim to be concerned about issues such as climate change have descended upon US cities with great zeal to protest Donald Trump’s election. Instead of decrying that the puppet on the right beat the puppet on the left, these supposedly “concerned citizens” should be fighting against the real and inexcusable acts of injustice taking place in North Dakota – against animals and humans alike.